Rule 1: No defying physics. Rule 2: No changing someone’s thoughts or heart. Rule 3: You will always get exactly what you wish for. Always. Eight-year-old Ezekial Archer hates his life. He’s bullied at school, his parents are mean, and no one understands him. All that changes when an eccentric shopkeeper gives him a bottle containing Paribanu: genie, fairy godmother, guardian angel. With just a few simple wishes, he can change his whole life. 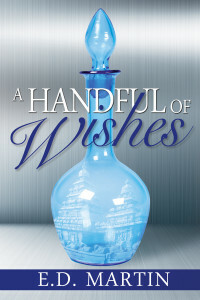 But wishes have consequences, and when Zeke’s first wish gives him exactly what he asks for, with terrible unintended consequences, he vows to never wish again. Unfortunately for him, his genie has an agenda, and she’s determined to help him succeed in life, whether he likes it or not.